Charlie Chaplin sings and dances, originally uploaded by princess_yoj. There are a few pics that we took at the Jason Mraz gig on my Flickr page... 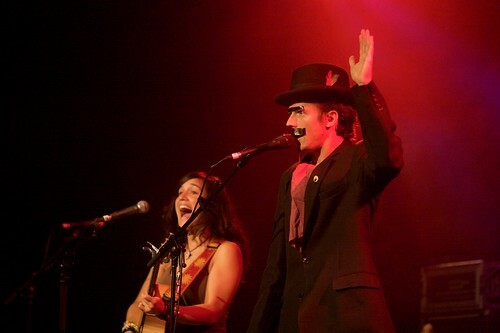 The one here is of Jason pretending to be a strange New Jersey Charlie Chaplin-esque dude with gaff tape stuck on his face, as he sang with the opening act chick... Hah! So was this opening act chick better than the one from last time? cause I did NOT like the last one...haha! There was a guy at sunday school this morning with his kids that looks EXACTLY like Jason...I had such a hard time trying not to stare.